For months, I’ve been arguing that the big reduction in the corporate tax rate is the most important part of Trump’s tax agenda. But not because of politics or anything like that. Instead, my goal is to enable additional growth by shifting to a system that doesn’t do as much damage to investment and job creation. A lower rate is consistent with good theory, and there’s also recent research from Australia and Germany to support my position. Especially since the United States is falling behind the rest of the world. America now has the highest corporate tax rate in the developed world and arguably may have the highest rate in the entire world. Needless to say, this is a self-inflicted wound on U.S. competitiveness. But since the numbers I’ve been sharing are now a few year’s old, let’s now update some of this data. 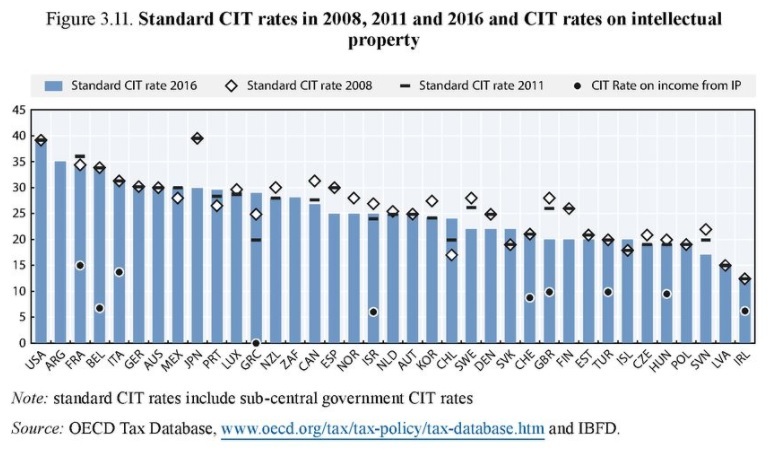 Check out these four charts from a new OECD annual report on tax policy changes (the some one that I cited a few days ago when explaining that European-sized government means a suffocating tax burden on the poor and middle class). Here’s the grim data on the corporate income tax rate (the vertical blue bars). As you can see, the United wins the booby prize for having the highest rate. But here’s some “good news.” When you add in the second layer of tax on corporate income, the United States is “only” in third place, about where we were back in 2011. 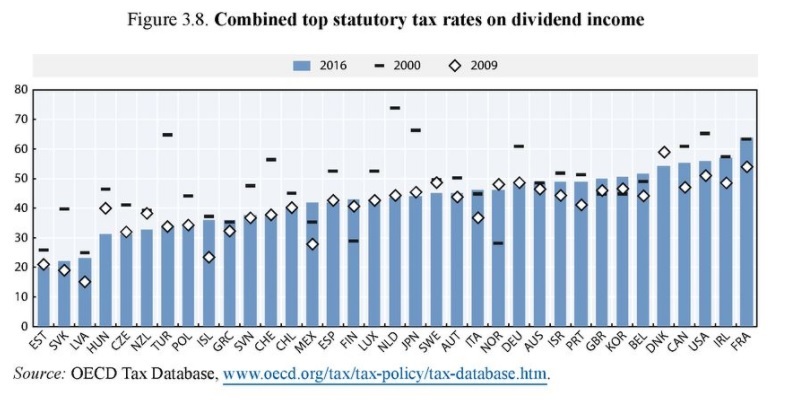 France imposes the highest combined rate on corporate and dividend income (no surprise since the nation’s national sport is taxation), while Ireland is in second place (the corporate rate is very low, but personal rates are high and dividends receive no protection from double taxation). For what it’s worth, I think it’s incredibly bad policy when governments are skimming 30 percent, 40 percent, 50 percent, and even 60 percent of the income being generated by business investment. Particularly since high rates don’t translate into high revenue. Check out this third chart. 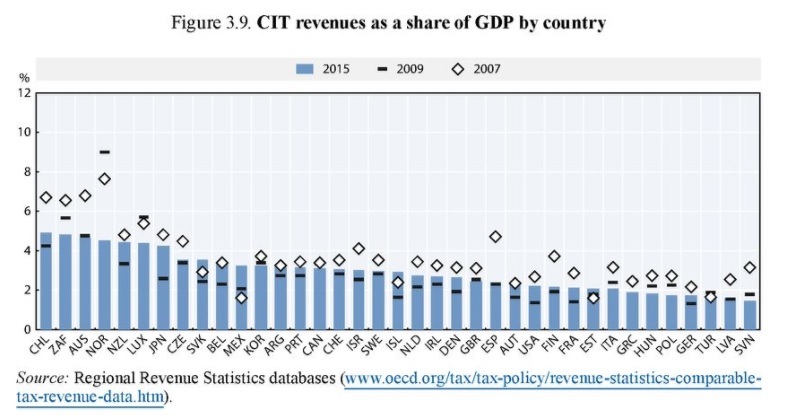 You’ll notice that revenues are relatively low in the United States even though (or perhaps because) the tax rate is very high. But our final chart provides the strongest evidence. 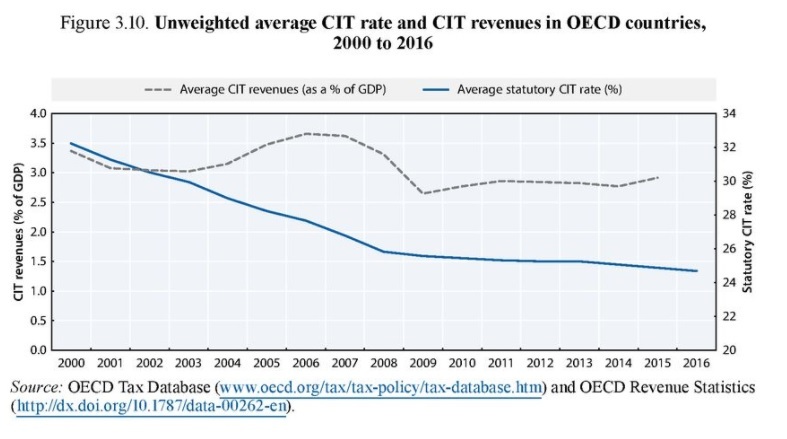 Just like the IMF, the OECD is admitting that tax revenues have remained constant over time, even though (or because) corporate tax rates have plunged. Incidentally, the global shift to lower tax rates hasn’t stopped. I wrote back in May about plans for lower corporate tax burdens in Hungary and the United Kingdom and I noted last November that Croatia was lowering its corporate rate. And, thanks to liberalizing effect of tax competition, more and more nations are hopping on the tax cut bandwagon. Consider what’s happening in Sweden. Sweden’s center-left minority government is proposing a corporate tax cut to 20 percent from 22 percent, Finance Minister Magdalena Andersson and Financial Markets Minister Per Bolund said on Monday… “With the proposals we want to strengthen competitiveness and create a more dynamic business climate,” they said… The proposed corporate tax cut would be…implemented on July 1, 2018. Or what’s taking place in Belgium. …government ministers finally reached agreement on a number of reforms to the Belgian tax and employment systems. …Belgium is to slash corporation tax from 34% to 29% next year. By 2020 corporation tax will have been cut to 25%. …Capital gains tax on the first 627 euros of dividends from shares disappears, a measure intended to encourage share ownership. Or what’s looming in Germany. Germany will likely need to make changes to its corporation tax system in coming years in response to growing tax competition from other countries, Finance Minister Wolfgang Schaeuble said on Wednesday… “I expect there will be a need to take action on corporation tax in coming years because in some countries, from the U.S. to Britain, but also on other continents, there are many considerations where we can’t simply say we’ll ignore them,” Schaeuble told a real estate conference. This bring a smile to my face. Greedy politicians are being pressured to cut tax rates, even though they would prefer to do the opposite. Let’s hope the United States joins this “race to the bottom” before it’s too late. companies know what tax they will pay. Ironically they will pay more if deductions are removed for revenue neutral considerations thus the effective rate moves higher. This would increase uncertainty. business sector most of who would pay the nominal rate. not sure it would have a great effect on overall revenue though. Well I am a big believer in the Friedmanite flat tax!! Well, I don’t pretend to know all countries for all time periods, but I do have some experience with this topic. The effective corporate tax rate is not usually a known constant, applicable year in and year out at a consistent rate. Differing circumstances usually cause the effective tax rate to vary. Because companies cannot know what the future tax rate will be, they often use the statutory tax rate when evaluating investments. But I do agree that any company that can have a firm idea of its future effective tax rate should use that for evaluating investments. On your second point, I think you need to expand your consideration beyond just dollars (AUD or USD). The bigger impact of tax reform is not (Keynesian) dollars-in-pocket for businesses or individuals, but the behavioral incentive at the margin to encourage productive economic activity. I think a lower tax rate combined with elimination of tax preference distortions will lead to greater economic growth and long-term prosperity, even if it appears as ‘revenue-neutral’ today. That is, the right revenue-neutral tax reform can still be beneficial. Does News Corp make that decision for example. Why would the nominal rate be brought into a decision when it is never used! Two other things. is the corporate tax cut gong to be brought in in a revenue neutral way. Say reduce the nominal rate but reduce some deductions. This would negate any benefit! I am sceptical of benefit of a corporate tax cut in general. We are having this very same debate down under as the government is proposing one.company tax is but one factor companies examine when investing.Our Treasury has only very minor benefits coming from the proposed tax cut. Now if it were a flat tax or even a linear tax then the case would have a lot of legs. I think you are missing two important points. First, it is not only effective tax rates that matter to a business. Businesses often cannot count on paying a lower effective tax rate on future profit generated by their investments, so they often evaluate their investment projects using statutory tax rates. Therefore, a high statutory tax rate still tends to depress business investment. This is bad. Second, the US corporate rate is still higher than many countries on an effective rate basis. Not the highest as with the statutory rate, but among the highest. High enough to make the point still valid that the US corporate tax code is uncompetitive. Corp pay taxes with $$ they get from their customers who get it from their customers and so on. The only source of $$ to the government is the earnings of individuals. All business can do is collect it. I have never heard why the business tax rate should be anything above 0%. Can you tell me? You are talking about nominal; tax rates. What is important for a company is the effective tax rate. This is usually much lower than the nominal rate. The other problem is when countries cut company taxes they rarely cut spending thus boosting the deficit.